If you take care of our skin you will maintain a healthy and youthful look even as you age. Genetics is an important factor in the aging process, but that does not mean that you can’t alter it. You still have some control regarding how you look as you age. The good news is you can slow down the aging process and maintain younger-looking skin. Use sunscreen. Whether you generally stay indoors or are exposed to the sun regularly, it is important to wear sunscreen any time you are outside. Sunscreen blocks rays that can cause premature aging. You should also use a sunscreen with a higher SPF protection on your face. Choose a sunscreen product with SPF 25 and above. If you are smoker, it is time to quit. Smoking adds years to your actual age. Not only does it make you look older, but it is also very bad for your health. Being exposed to smokers can also add to your aging, so avoid smoking and being in an environment with smokers. Get the right amount of sleep. Lack of sleep will cause you more than dark circles around your eyes. Lack of sleep can also lessen the repair process your body undertakes during sleep. If you lack sleep you will appear and feel stressed out, so make sure to get at least six hours of sleep every day. Wash your face and moisturize regularly. The dirt on your body and face will clog your pores, causing impurities like pimples to pop. If you want to avoid having pimples or acne, make sure you wash your face in the morning and at night. Use a gentle nonirritating cleanser and apply moisturizer to keep your skin hydrated. Do not over exfoliate. 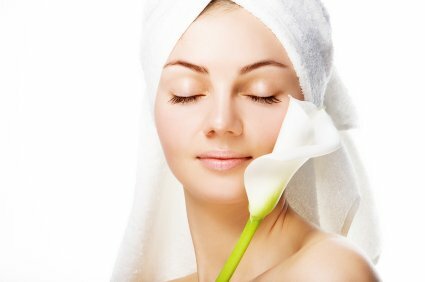 Exfoliating is good if done in moderation, but over exfoliating can dry your skin and cause it to lose its natural oils. It is advisable to exfoliate only twice or thrice a week. Eat foods rich in Omega 3. Fish, shrimp and other sea foods are rich in Omega 3, which can promote younger-looking and healthy skin. Omega 3 keeps the skin moist and gives it a natural, healthy glow. If you can’t eat fish on a regular basis, take an Omega 3 capsule daily. Take vitamin E. You can take it in a capsule form or eat foods rich in vitamin E. This will provide antioxidants that fight the signs of aging. You can also apply lotions and moisturizers enriched with vitamin E.
Exercise regularly. When you exercise your body produces serotonin that gives your skin an instant glow. Exercising will also make your body more toned, firm and healthy. A 15-minute walk or jog every day is enough, or you can get involved in sports and other fun physical activities.